Yes, it takes a village. 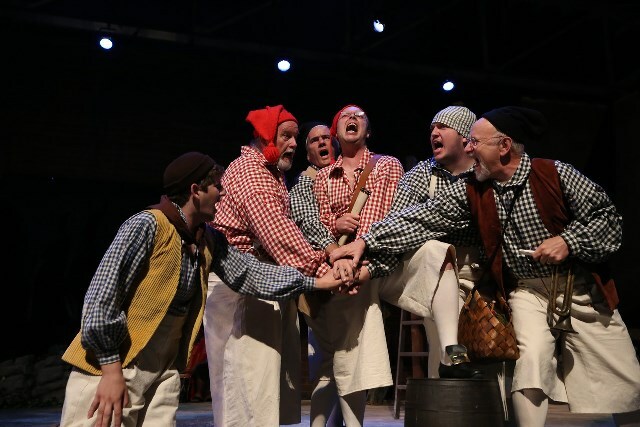 Shakespeare Orange County has pulled out all the stops, and even enlisted a not-so-secret weapon, to accomplish an extraordinarily beautiful debut in its first official production under new artistic director, John Walcutt. No less than 30 actors, 32 dancers, 10 drummers, a creative staff of 13, and countless additional volunteers have brought this Polynesian Dream, set in the 1700s, to life. It is a remarkable achievement that all starts with the intoxicating world created by director Susan Angelo. And what a world it is. The drumming begins and from all sides they come: down the aisles, out from the wings, up onto the stage, almost as though they walk on air – each cluster filling the space with its own charismatic energy. There are silky-skinned Polynesian dancers who mesmerize with their skill; British colonials full of militaristic intensity; a band of mischievous fairies led by a dark and imposing king, and a fairy queen in gossamer white with an entourage of colorful pixies. It is an electrifying and unforgettable prologue, not only to A Midsummer Night’s Dream but to Shakespeare Orange County’s next chapter as well. Building on what they have accomplished in previous years under the leadership of longtime artistic director Thomas Bradac, SOC now extends its reach further into the community to forge new partnerships and new cultural alliances. In that respect it is not unlike the worlds that Shakespeare brings together in his play where lovers, amateur actors, and creatures of the woods converge on one magical midsummer night. As their situations become hopelessly entangled, passions rise and the resulting confusion facilitates some of the Bard’s most comical interplay written. The crowning glory of this Midsummer is the award-winning Polynesian dance group, Hitia O Te Ra, who are also co-producers of the production. Contributing eight authentic dances as part of the story, they demonstrate astounding displays of physical stamina and artistic beauty. Program notes include the translation of each of the pieces, all of which are expertly choreographed by Malia Tafu. 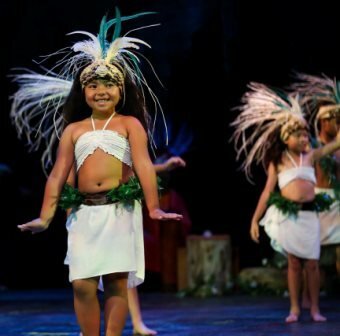 Even the children are featured when Titania commands that the fairies sing her a lullaby while the adorable young dancers of Hitia O Te Ra (under the direction of Bebe Anae) accompany them in an enchanting transition into dreamland. Angelo elicits dynamic performances from her appealing multicultural cast made up of many SOC regulars and a number of welcome fresh faces. Demetrius (Morgan Lauff) and Lysander (EJ Arriola) both embody the impetuousness of youth in distinctly different ways. 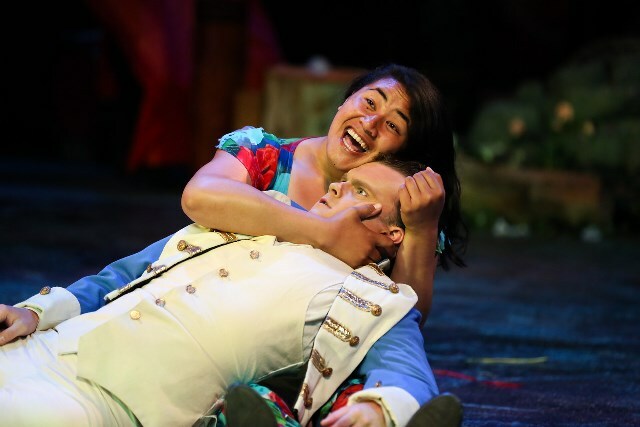 When their tussles turn into a flat out lovers’ chase scene – with Hermia (Mikki Pagdonsolan) in tow and Helena (Patricia Fa’asua) on the run – the foursome’s antics dissolve into physical hilarity. What’s even funnier is the way that Angelo stages Oberon, Puck (Evelyn Carol Case) and his mischief-making fairies with their heads peeking up over the ground watching their foolishness or frozen mid-movement to avoid detection. Her stage pictures throughout the show are a visual delight. 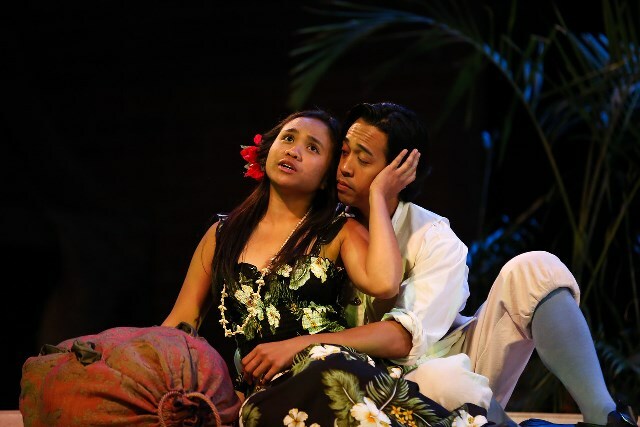 Pagdonsolan is a sweetly sincere young woman whose inner wildcat comes out when she is cast aside by both men in favor of Helena, and Fa’ausa’s adroit comedic instincts are dead-on every single time. I love an actor who can make me laugh out loud and she did it over and over again. Miguel Perez (Oberon) and Amanda Zarr (Titania) offer a powerful contrast of dark mystery and airy sensuality. Their intricate makeup designs and gorgeous costumes by Shon LeBlanc from The Costume House complete the sublime transformation. And the show’s secret weapon? None other than the aforementioned Thomas Bradac, who returns to the stage after 16 years in an absolutely wonderful performance as Bottom, the weaver. This veteran actor will jump into the madness without hesitation, weave a tall tale while exciting even himself, succumb to a fairy seduction as if it was the most natural thing in the world, and deliver one of the funniest dying scenes this side of the Mississippi, all with a childlike twinkle in his eye and a self-deprecating sense of humor that will endear you to him the moment he steps on stage. Among the Mechanicals, Nicholas Thurkettle is quite charming in his turn as Peter Quince, author of The Most Lamentable Comedy and Most Cruel Death of Pyramus and Thisbe that he and his fellow actors will present at the end of the play. There is also fine work from Jeremy Schaeg (Theseus), Kabua Miyahira-Chow (Hippolyta) and Bryan Taylor (Egeus) in their respective roles. His soul may be in the sky, as Bottom says midway through Pyramus’ famous death speech but it is certainly clear that all of SOC’s heart is on the stage in this most auspicious beginning of the new Shakespeare Orange County.